But that replacement apparently didn’t happen fast enough for one motorist, who was driving on the Southeast Expressway around 5 a.m. one recent morning when the utility pole “dropped like a tree.” The driver said he saw the pole falling, but was unable to react fast enough to avoid it. He drove over the pole, resulting in the destruction of the undercarriage of his truck. His tires blew out and the pole was sent flying toward another vehicle, driven by a father of six. That driver, who also survived, explained it was dark and happened very quickly, leaving him no real time to react. Several other vehicles piled up also, though miraculously, no one was seriously injured. Although the incident was described as a “freak accident,” it still raises the question of foreseeability. In general, utility poles are more often involved in auto accidents when a driver strikes one. Impact with utility poles is a category of crashes all its own, and accounts for a substantial number of fatal accidents. Roadway jurisdictions (i.e., towns, cities and the state) and the utility companies can share responsibility when these crashes occur if motorists can show the infrastructure was placed too close to vehicular traffic. This would create a foreseeable hazard. Courts have held that crashes are a frequent and inevitable contingency of normal motor vehicle use, and there is further recognition between the reason a car leaves the roadway and the damage suffered in a subsequent collision with a utility pole or other structure. Transportation design and policy standards set forth clear guidelines for a so-called “clear zone” along the side of the road that is supposed to be unobstructed. Failure to do this could be grounds to assert liability. This case, however, is different because it involves the structural failure of a pole. This is a matter of roadway maintenance rather than design. The question of which entity would be liable in a case like this depends largely on who owned the pole and the property. That could be the state, but it may also be the utility company. 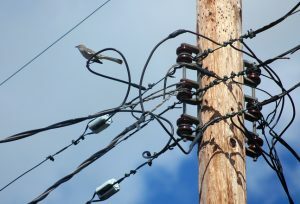 A report last year by 7 News Boston indicated dangerous utility poles are increasingly a problem in the Boston area as the utility infrastructure ages. While cities and towns notify utility companies about potentially dangerous or damages poles that should be replaced, actual replacement can take years. Some complain that unless there is constant pressure or some other high-profile incident, companies are slow to act to replace due to the cost. There are reportedly 30,000 “double poles,” according to the Massachusetts Department of Public Utilities. These are poles that are damaged and have the temporary fix of a newer one attached. Of these 30,000, several hundred have been on the list for replacement for approximately 10 years. State lawmakers considered a measure a few years ago that would have resulted in fines against utility companies that fail to replace defective or faulty poles within a few months, but the bill faltered.